March Fong Eu, a pioneering Asian American politician, died on Dec. 21 at the age of 95. Eu was the first woman to serve as California secretary of state and the first Chinese American to hold statewide office. The Los Angeles Times quoted Eu’s longtime spokeswoman, Caren Logomarsino, as saying that Eu suffered complications from surgery following a fall at her home in Irvine. “She was such an exemplary role model and an encouragement for women to break the glass ceiling,” Lagomarsino said. Born March Kong in Oakdale (Stanislaus County) in 1922, Eu grew up while living with her family in the back of a Chinese laundry in San Francisco and later Richmond. A graduate of UC Berkeley, she earned a master’s degree from Mills College in Oakland and a doctorate in education from Stanford University. She worked as a dental hygienist and served as president of the American Dental Hygienists Association. She was also a teacher in Oakland public schools. Known at the time as March K. Fong, Eu began her political career by serving three terms on the Alameda County Board of Education, then won election to the State Assembly — the first Asian American woman in California to do so — in 1966 and represented the 15th District (Oakland and Castro Valley) until 1974. 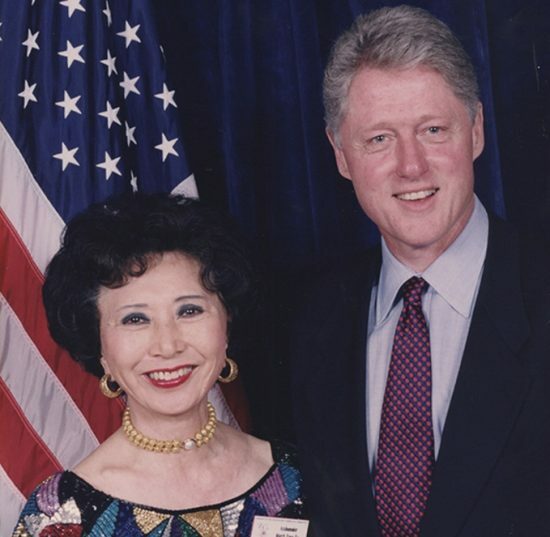 March Fong Eu with President Bill Clinton, who named her U.S. ambassador to Micronesia in 1994. Eu also gained national notoriety for her successful campaign to ban pay toilets from public buildings, which she said symbolized the second-class treatment of women who were forced to fumble for pocket change in their purses just to use a bathroom while there was no such requirement for urinals in men’s facilities. Although she was ridiculed by her male colleagues, Gov. Ronald Reagan signed a bill banning pay toilets in public buildings in 1974. Eu was elected secretary of state five times, holding the office from 1974 to 1994, and is credited with such innovations as voter registration by mail, providing absentee ballots to anyone who requested them, and including candidate statements in ballot pamphlets. In 1986, she was beaten and robbed at her Hancock Park residence. The assailant was later captured. In 1988, Eu sought the Democratic nomination for U.S. Senate and would have been the state’s first female senator had she been elected. However, she withdrew because her second husband, Singapore millionaire Henry Eu, did not want to disclose his financial holdings. She was appointed U.S. ambassador to the Federated States of Micronesia by President Bill Clinton and served from 1994 to 1996. In 2002, at the age of 79, Eu ran again for secretary of state, saying that she was angered by the voting problems in Florida during the 2000 presidential election, which resulted in Republican George W. Bush’s win over Democrat Al Gore. She narrowly lost in the Democratic primary to Kevin Shelley, who went on to win the general election. Services are pending. Eu is survived by her daughter Suyin Stein, four grandchildren and numerous nieces and nephews. Her son, Matthew Fong, who died of cancer in 2011, served as state treasurer from 1994 to 1998. Although she was a Democrat, Eu supported her Republican son’s unsuccessful bid to unseat Sen. Barbara Boxer (D-Calif.) in 1998. Current Asian American officeholders cited Eu as a role model. “March was a trailblazer for Asian Americans and women,” said State Treasurer John Chiang, a candidate for governor. “… She showed me and other Asian Americans that we too could serve our state and nation by entering public office as elected officials and policy makers. “During her four terms as secretary of state, she served the people of California by making voting easier and more efficient, thus encouraging greater voter participation. Her legacy in California will live on forever. “California has lost a true trailblazer with the departure of the Honorable March Fong Eu,” said State Controller Betty Yee. “Our elections system today reflects many of Secretary Eu’s contributions that include voter registration by mail, absentee ballots upon request, and candidate statements in ballot pamphlets. 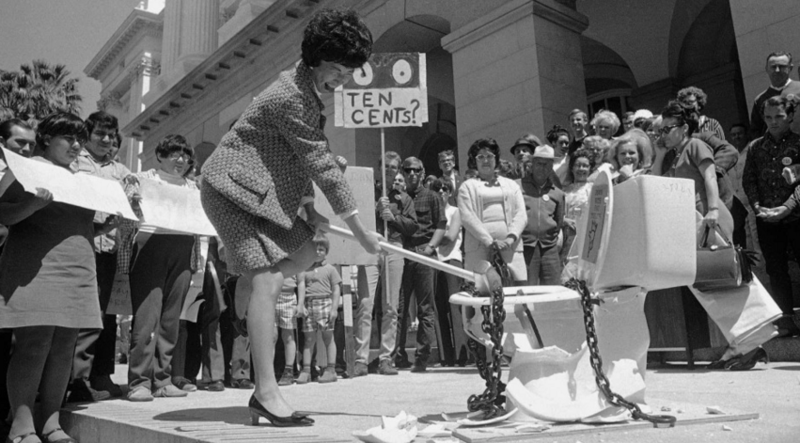 “As a State Assembly member, Secretary Eu led the feminist movement in California to ban pay toilets, the subject of many jokes yet the most basic aspect of gender discrimination.